Many of our machines come with a number of different attachments. Concrete Edgers however only have discs to grind up to the edge of a concrete slab. As you progress with your concrete surface preparation, you will need to switch discs. Switching discs is very easy (we always recommend you wear gloves). There's a locking pin on the side of the grinder. Push the pin in and spin the disc until it locks into place. Once locked, take a spanner and use it on the centre nut to remove the disc. Replace with the new disc and tighten up again. Ideal for indoor floor surface renovations. 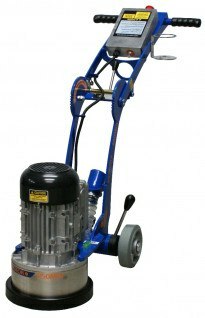 Removes paint, traffic lines, fibre glass, epoxy and adhesives, expose aggregate or grind surface imperfections etc. 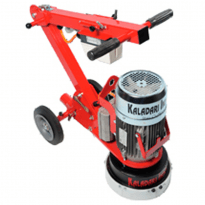 A popular single disc floor grinding machine for professionals. Aggressive and compact machine ideal for small areas.